Very unusual for a house of this period, are the high beamed ceilings throughout. There is tremendous scope for improvement and modernisation of this Grade II listed property. 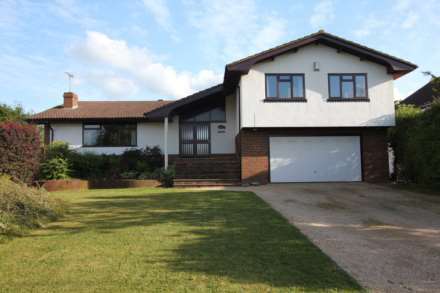 Situated in a peaceful sleepy rural area noted for its outstanding beauty yet within easy access of Pangbourne. Just a short drive away, Pangbourne has an outstanding selection of shops and mainline station giving access to London Paddington. Buckhold also gives an easy route to junction 12 of the M4 at Theale. It is rare that such a beautiful period house comes onto the market in such an outstanding location. Summary of accommodation: Oak framed enclosed porch, entrance hall, interior hall, sitting room, dining room, kitchen, utility room, study, oak framed garden room, 5 bedrooms, 2 bathrooms, double detached garage, garden stores. Local facilities: Pangbourne village is just a 7 minutes` drive and has a fabulous selection of award winning specialist shops, restaurants, riverside pubs, a health centre, dentists, hairdressers and a train station giving fast train service connections to London Paddington. Bradfield College is 2 miles away and has a fabulous sports complex within walking distance open to public membership, with a fine indoor pool, indoor and outdoor tennis courts, squash, gym and fitness centre. There is a 9-hole golf course at Bradfield College which is open to public membership. Schools: Buckhold is within the catchment area for Bradfield Primary School, it is also within easy driving distance of Bradfield College, Pangbourne College, St Andrew`s Preparatory School, Cranford House, Moulsford Preparatory, Elstree, St Gabriel`s Girls School and Downe House Girls School. Directions: From the offices of Singleton & Daughter turn left, proceed over the mini roundabout and turn first right at St James the Less Church. Proceed up Pangbourne Hill following the signs for Yattendon at the T-junction turn left and Slade Gate Cottage will be found a short distance along on the left hand side, the last property. Services: Mains electricity, septic tank drainage, estate metered water, electric central heating.